We offer the following types of shaft construction. The Ultralight is our standard lightweight, all carbon fiber shaft that is most commonly used at all levels of rowing and racing today. Over the years we have refined the construction of this shaft to be as durable as possible. Made of high modulus carbon fiber, the Skinny is a smaller diameter shaft that offers a softer feel. This can be particularly beneficial to those looking for the efficiency of the Fat2 blade but who want their oar to feel less stiff. The small diameter also reduces wind resistance, which can be very significant in a headwind. Skinny shafts weigh the same as Ultralight shafts. The Low i shaft uses high modulus carbon fiber, rather than the more standard carbon fiber used in Ultralights. Using the stiffer carbon allows us to use less material to achieve a lighter shaft. We use the same high modulus carbon in the blade of the Low i scull to achieve overall weight reduction and extremely low swing weight—the weight at the blade that is felt each time the oar changes direction. 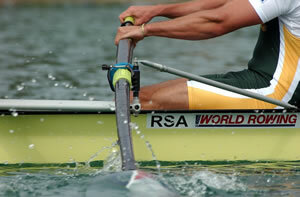 Those rowing with higher stroke rates stand to benefit from using Low i sculls. Designed for serious racers, these sculls are less resistant to impact damage than Ultralights.